Dr. Barnard is past chair of Universities Canada. His career includes serving as president and vice-chancellor of the University of Regina (1998-2005), and as vice-president, administration, and controller (1996-1998). He previously spent 19 years at Queen’s University where he was a professor of computing and information science and assumed several increasingly senior administrative roles, including associate to the vice-principals research, human services and resources at various times. In 2005-08 he was chief operating officer of iQmetrix, an IT company that provides information and technology solutions for the retail and health sectors. Dr. Barnard has extensive board experience including at the Bank of Canada executive committee; Canadian Network for the Advancement of Research, Industry and Education; the Saskatchewan Provincial Court Commission (chair); Saskatchewan Power Corporation (chair); and the Canada West Foundation. 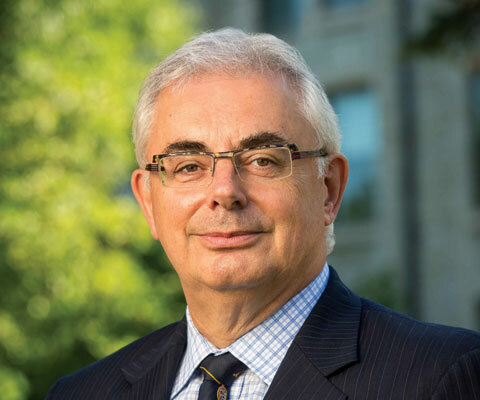 Currently he chairs the Canadian Research Knowledge Network and is a board member of Greystone Managed Investments, St. Boniface General Hospital, the Canadian Scholarship Trust Foundation, and CentreVenture Development Corporation. Dr. Barnard holds BSc, MSc and PhD degrees in computer science from the University of Toronto and a Dip.CS in theological studies from Regent College, University of British Columbia.